It's a lovely day, so I set a table for my husband and myself on our deck off the study. It is a great spot to eat lunch. The fountain has a very soothing sound. Fuschia's hang from the trellis, along with huge palms in urns. This is such a happy color. 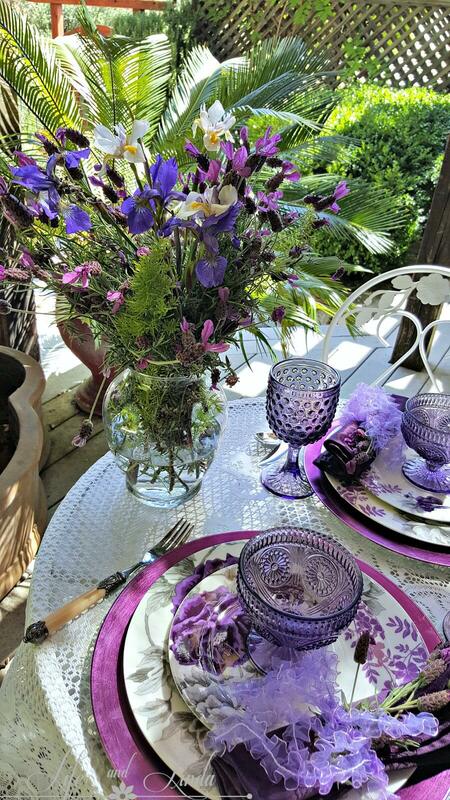 Purple chargers, along with white and purple floral plates set the mood for this luncheon. 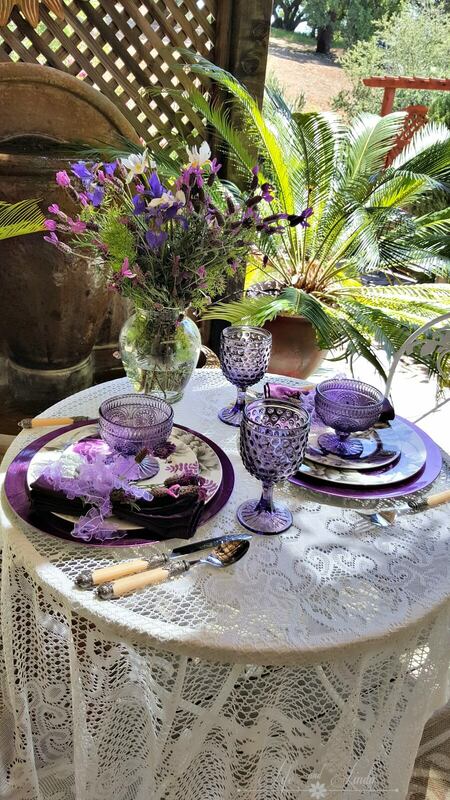 Glass purple compotes complete the look along with the hobnail goblets. I cut some lavender from our garden for the centerpiece. I also added some with the napkin. Today I mowed our small lawn and did some weeding. I then cleaned everything off with the blower. We finally received our new beds with the adjustable base. I will be writing a post on the new beds soon. We are getting used to them, with all of their bells and whistles. It is a pleasure to watch tv in bed now or read. No more propping up pillows. I also have a tutorial for a new recipe plugin for Blogger that I will be sharing soon. 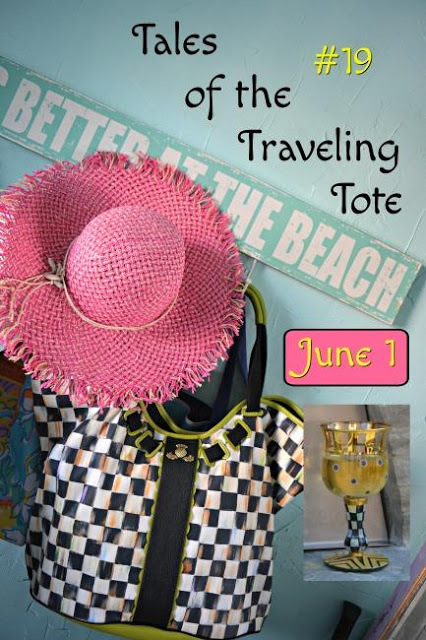 Happy weekend and don't forget to link up to Sunday's Dishing It & Digging It party. I love that you set a pretty table for lunch with your hubby. I am loving you new blog design too!! Thanks so much Lauren. I do enjoy changing my blog design. Thanks Deb. Yes, we will be writing the bed review soon. You two:) So cute to see you do this! Thank you Monique. We spend a lot a lot of time together. Eating outdoors is a pleasure when the weather is nice. Hi Linda! Oh, this is just a gorgeous setting. 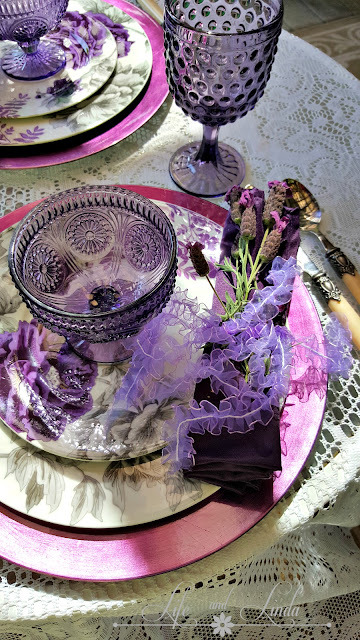 Your lace table cloth is so pretty and the purple is so lovely! Your dishes, the compotes and glasses, the centerpiece! Gorgeous! I can just imagine how wonderful to sit outside at your pretty table and hear your fountain! You're the most wonderful one. 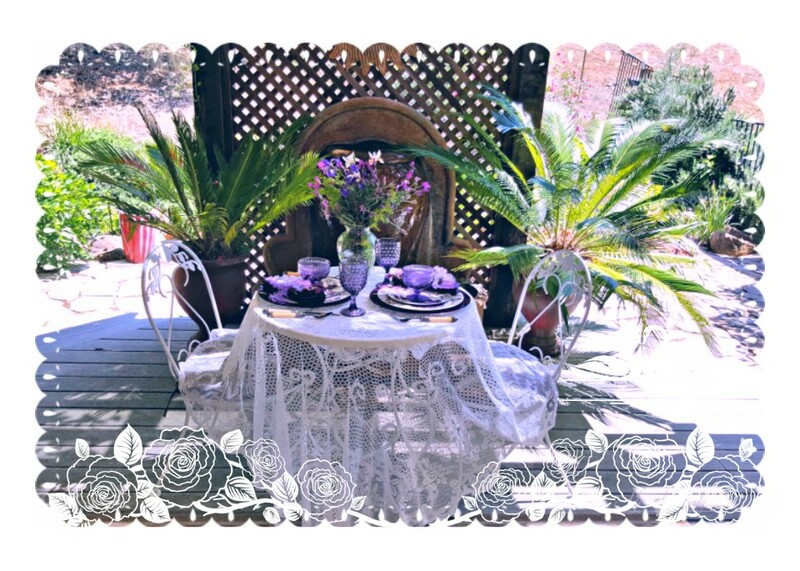 What a cute table for a garden lunch! The purples are like beautiful amethysts. My, my, my...what a beautiful table you've set. I love the purple - with the white and purple plates! Absolutely gorgeous. I can just imagine the scent of the lavender you cut! I have never seen purple dishes and glassware. I so envy you. I love the color purple. Pretty place to enjoy a meal. The purple makes this setting very regal. Good morning Linda!!! !What a gorgeous color. Anything in the blue family from aqua (my favorite) through colbalt blue to lavender just hits me right. And your patio area, you'd think it was in the South of France or maybe England! HAVE FUN!!!!! 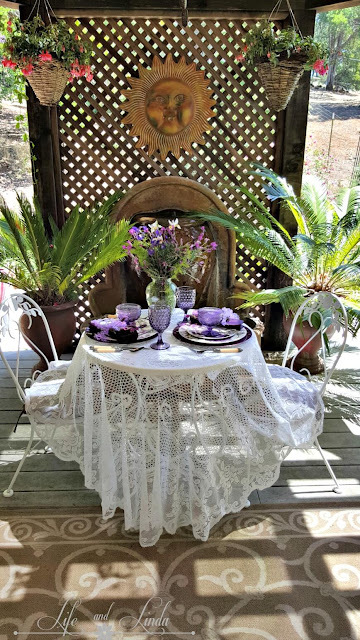 So pretty Linda- love the Lacy tablecloth draped on the chairs. The purple is striking and looks so good outdoors. I bet that new bed is wonderful! It's outside for me today to work in the yard. 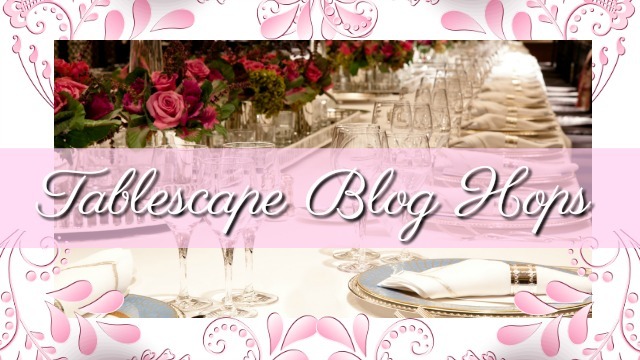 See you Sunday at the blog party! I just love the colour purple and when you combine it with a simple white and green accents, nothing beats it for simplicity, elegance and freshness. Such a lovely table you've created, Linda. I'm looking enviously at your palm and wondering if I'll ever see green on the trees, lol. Wow, hat a gorgeous setting. And I love the table, the purple is really making me smile. It would be hard for me to leave that spot. 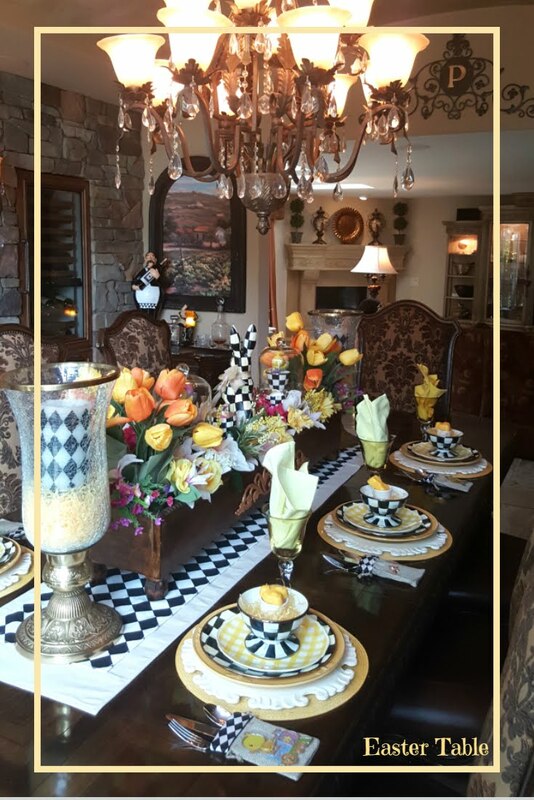 What a pretty table for you and your hubby, Linda! I love the fuchsias and the palms, with the fountain. I can just picture how relaxing it is! Rich and I bought an adjustable bed back in 2009, and I love it. I'm sitting in it right now, eating my breakfast, watching TV and writing to you! Happy weekend to you! Wow! Purple is one of my favorite colors and I have a hand blown candy dish on my dining room table with two other pieces right now. I love Lilacs and purple always reminds me of them and Iris's. Beautiful centerpiece! Linda, your purple table setting is so pretty… a favorite color. Enjoy the weekend! 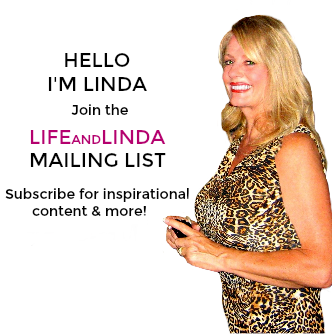 GOod morning dearest Linda! Thank you for coming to visit my blog post! I am having such fun with my friend who models for me! We took more photos last Sunday and today we are at it again! I so wish I could create my own magazine!!!! Purple is my favoutite color!! How wonderful to turn an everyday meal into a celebration. And I must say, Linda, you have the prettiest dishes. Oh my, this is pretty. It's so elegant, and I love the table cloth. Purple, my favorite color! It's such an enchanting color, and those plates are stunning. Linda, your table looks absolutely lovely. 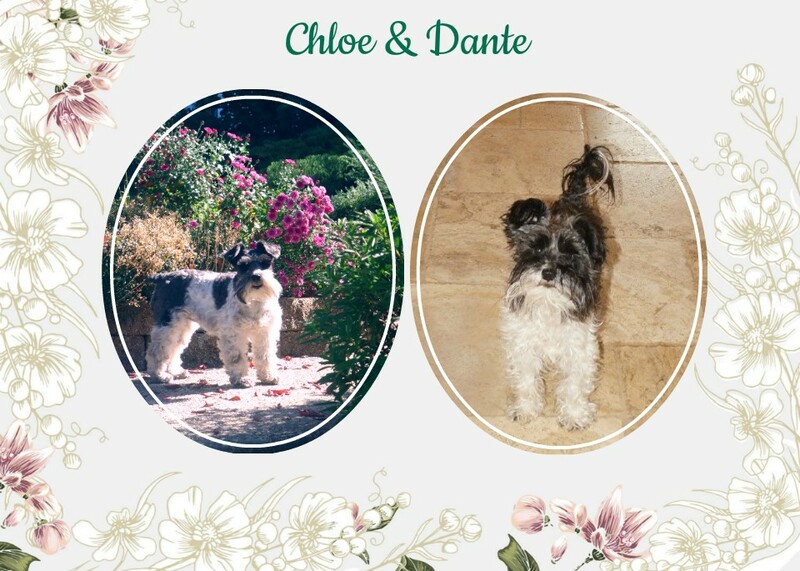 Thanks for stopping by the weekend blog.. 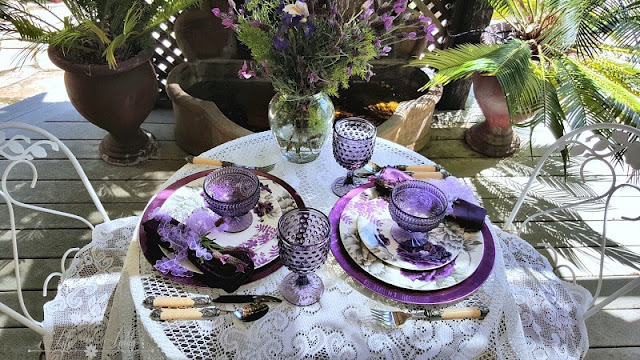 Your purples are just stunning, and that lacy tablecloth makes it so romantic! We have been rainy, cold and windy here all week, so this looks especially nice. I can just imagine it with the sound of the water in the background! Purple is one of my favorite colors and your table is so inviting. Wish I had your deck outside my bedroom. Oh how pretty Linda! 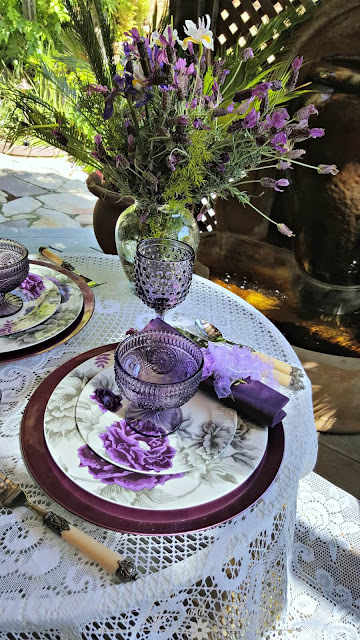 I love all your purple dishware, so different and stunning in that beautiful outdoor setting! This is a gorgeous table, Linda! You are so sweet to set such a pretty table for your lunch! I LOVE the purples!!!! Of course the setting is beautiful! We love eating lunch outside and hearing the waterfall in the pond too. Now if Mother Nature would just cooperate! Love love your purple!!! I missed this post last week. I was so busy preparing to entertain! Everything is beautiful. Love the hobnob glasses and the other compote pattern. It looks great to mix the textures! Your dishes and chargers are perfect and the flowers! I know the scent was wonderful. Hi Linda, this is such a pretty table setting! 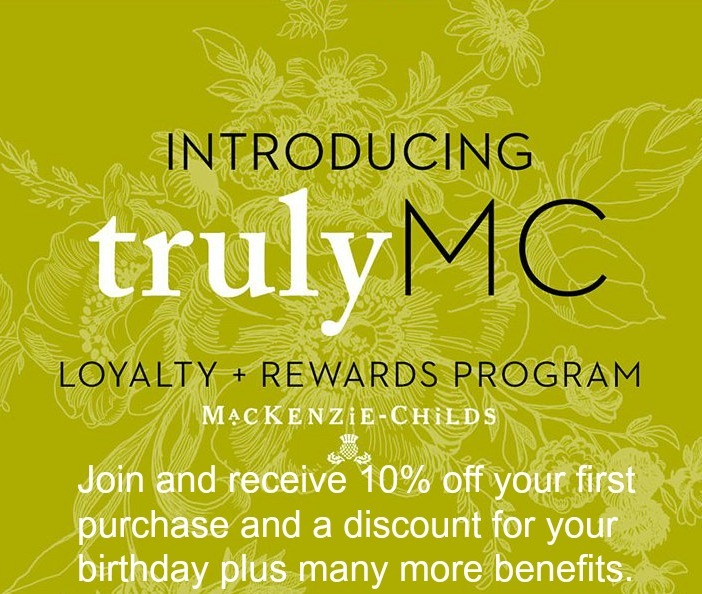 Just letting you know I'll be featuring this at Best of the Weekend tonight! Hope you'll be back! 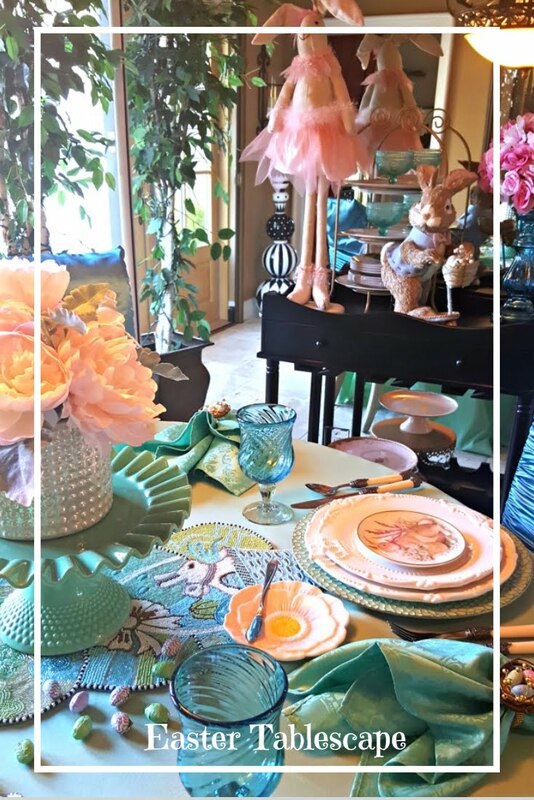 Wow Linda, what a gorgeous table setting. I love the purple theme and the deck is so pretty.